Put on a full set of raingear. In one pocket put a peanutbutter and jelly sandwich, and in the other pocket put a $100 bill. Go into the bathroom. Turn on the shower to cold. Go to the toilet and flush the $100 bill down the toilet. Stand in the shower and eat your sandwich. That is what sailing is like. I tend to agree with the $100 bill. There is always something to repair, and as soon as it is labeled "Marine" the price is doubled- or even tripled. Unlike the story, our sailing has generally not been in the cold shower, but there have been times that I would like to have turned the temperature up, even in the Caribbean. 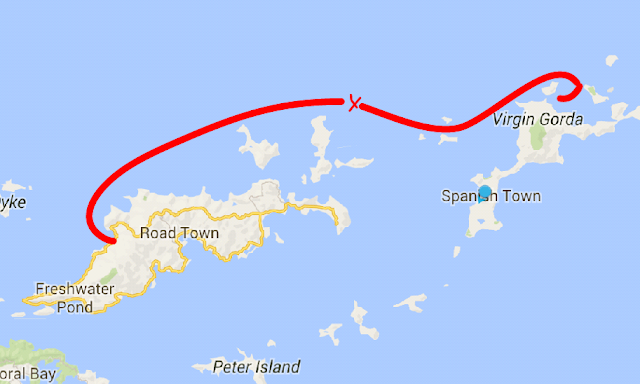 We took a trip upwind from Cane Garden Bay, Tortola, to North Sound, Virgin Gorda, both in the British Virgin Islands. Upwind sailing is very different than downwind sailing. Going upwind the waves are bigger, the wind is stronger and it is generally a less comfortable sail. This is why it is referred to as "beating upwind"
The wind was strong, the rain was in our faces and it certainly felt closer to Mom's description than we would have liked, however, Rhapsody is a strong boat and she took it like a trooper. I have been reading some books by Annie Dike about her experiences learning to sail. One of the things she has said is "pops, pings and bangs are generally regarded as bad things on boats". As we were about half way through our sail there was a loud pop. I looked out from under the bimini and saw a line flying loose from the top of the mast. It was our topping lift. This is the line that holds the boom up. We were very fortunate that we had a second line holding up the boom, although not as tightly as the topping lift had been holding it. We furled in our sail and proceeded to motor the rest of the way to our anchorage for the night. The boom was slightly lower than it had been, but it was held in place and did not fall any further. We made it safely to the anchorage and the following day sent Bob up the 50' mast, in the wind, to retrieve the topping lift. He always gets to do the "fun stuff"! The boom is back to where it should be, the offending shackle that twisted open to release the topping lift has been replaced with a larger stronger version, and we are aware of one more thing to keep an eye on, to avoid a repeat performance. Guest Blog "my Christmas Vacation"